The driver of an oil tanker was airlifted to hospital yesterday after his vehicle overturned on the A87, around seven miles east of Glen Shiel. 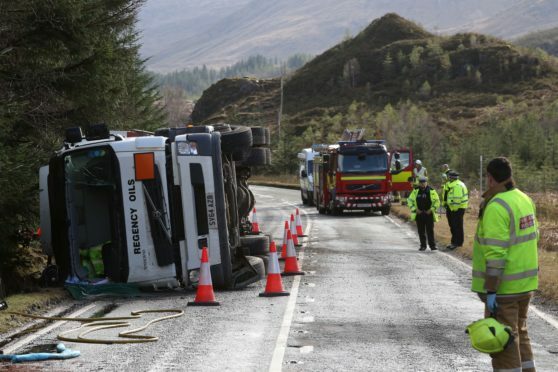 The driver of an oil tanker which overturned on a busy Highland road was airlifted to hospital yesterday with serious injuries. The incident on the A87 road to Skye, around seven miles east of Shiel Bridge, resulted in a diesel spill and a 136-mile diversion being put in place. Seven fire crews, police, an air ambulance and ambulance personnel were called to the scene at around 8.30am. The two occupants of the tanker, which was transporting red diesel for the marine industry, were trapped inside the cab of the vehicle as firefighters fought to free them. A specialist fire unit used to detect chemicals was stood down after being tasked from Balmossie in Dundee. The oil tanker was reported to be leaking diesel at a rate of half a litre per minute. Around 200 litres was contained in a roadside culvert. Regency Oils, owner of the tanker, sent an emergency response team to the incident to begin the specialist clear-up, with police arranging for recovery of the vehicle. A lengthy diversion consisting of around 136 miles was put in place, with motorists having to divert first by Drumnadrochit and then over towards Muir of Ord, before heading along the A835, A832 and A890 roads towards the Auchtertyre area to bypass the incident. Representatives from Bear Scotland, who maintain the trunk road, were in attendance to close the road and inform motorists of the diversion. A Scottish Ambulance Service spokesperson said: “We received a call at 8.33am to attend an incident on the A87 near the Cluanie Inn. His injuries were described as serious but not life-threatening. His colleague suffered minor injuries. Local councillor Biz Campbell said: “I’m thankful that they managed to get the driver out and wish him all the best for his recovery.